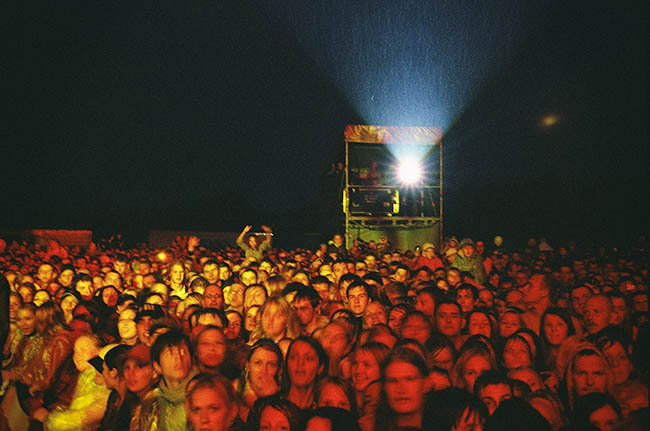 Here’s how one startup generated 400+ raving fans by piggybacking on other people’s awesome content. Image via Barn Images. At some point in your entrepreneurial life, you may be in a situation where you want to launch a product or service in a space where you have no audience. You may even be in that situation now. You know you need to build a large list of people in your target market. And you know you have to start by fostering relationships with that list (rather than reaching out and trying to sell to them cold). While all of this can be achieved through content marketing, you also know that effective content marketing takes a lot of time. …That is, if you’re creating your own content. But what if you didn’t have to? What if you could piggyback on the awesome content of others? 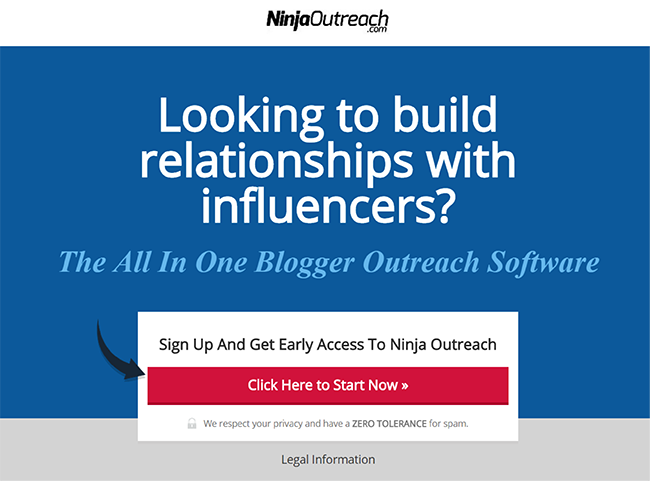 When we first started NinjaOutreach, our blogger outreach software, we decided to try this new approach. In the end, we attracted over 400 signups for our beta. Now, I want to tell you how we did it (and how you can too). For starters, you’re going to want to find articles that address the same problem that your product or service solves. Let’s say that you’re launching a digital product in the marketing niche. You’ll want to search for articles that target similar keywords as those from your product launch campaign. From this one piece of content, there are numerous people who have demonstrated that they’re looking for a solution to a specific problem. They’ve engaged with the content, now all you need to do is tease them out. The very first step will be to create a spreadsheet; this is effectively your outreach list. The exact columns are up to you, but undoubtedly you’re going to want columns for Name, Contact Info, and anything else that will allow you to personalize your email to them later. So, let’s start with getting authors. You’re also going to want to look for anything else that can help you personalize a future message to them (think latest tweets, recent articles, etc). A nifty Chrome plugin that helps with this is Ninja Outreach Lite (which, full disclosure, is my own plugin which I built for this purpose). 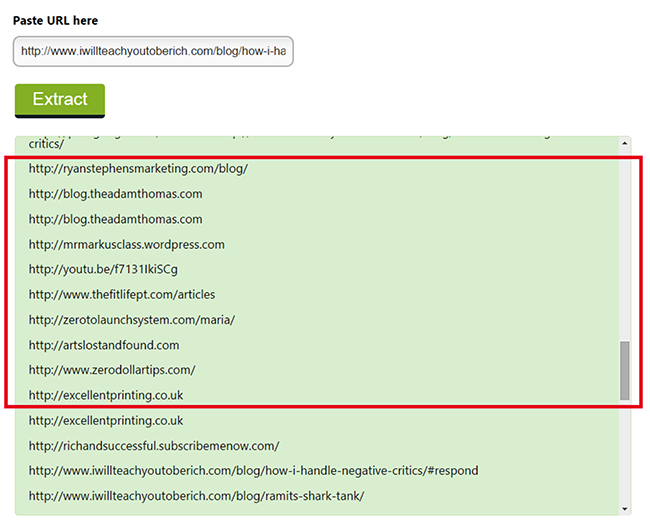 The plugin makes it very simple to add these to your outreach spreadsheet and file away. Moving on down the post, we’re going to target commenters, too. People tend to comment on posts that interest them. They’re engaged enough that they’re asking additional questions, which shows that they have a specific pain point that needs solving. In most cases, comments redirect to the individual’s web page – so now I just need to extract them. There’s a bunch of URL extractors for free on the internet. We use our free one at NinjaOutreach. You simply put in a URL and it will catch all of the links on the page. They are grouped in order, and it’s relatively painless to find the ones that belong to the comments section. This is an extraction from one of Ramit Sethi’s articles. Just look for the section where there are a lot of URLs that do not point at the author’s domain. From there, you can simply use the above extension to get the information you need. Now, let’s step outside the post just a hair, and grab the linkers and sharers. Of the posts you’re working with, there are people who will have read the post, commented on it and committed it to memory. Then, at a later date, they might link back to the post in an article they write. Articles that link to useful resources indicate to Google that the author is citing their sources, but they’re also relevant to us in the context of this strategy. It’s likely that these other posts strive to solve a similar problem, and have authors and commenters who belong to a similar target market. 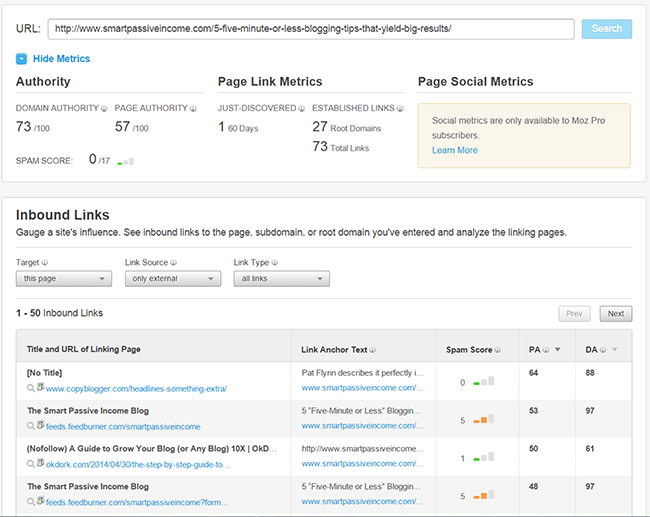 It’s easy to take the post and put it into Moz’s OpenSiteExplorer to find all of the linking domains to it. Even with a free account, I can export these links and add them to my document. To complete our outreach document, we simply have to add sharers. These are people that have demonstrated their interest by sharing relevant posts with their social network. 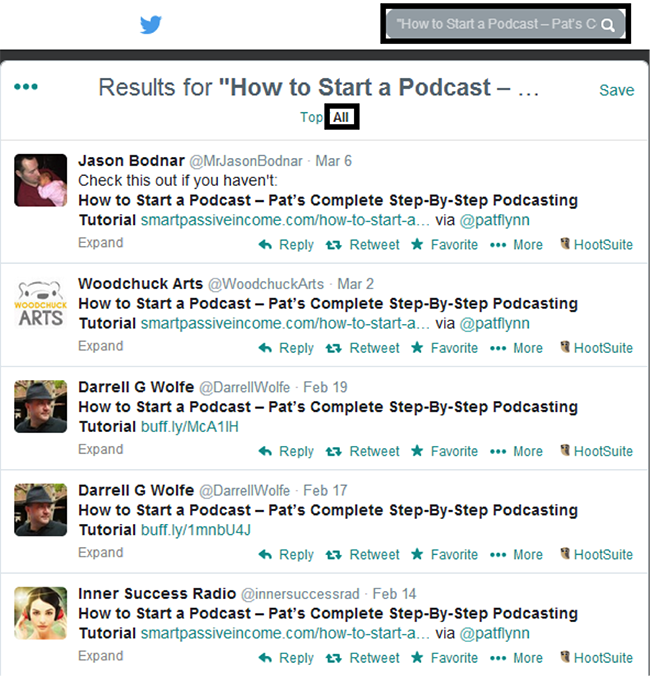 There is at least one solid way to retrace social shares: Twitter Search. Simply hit advanced search, then put the title in “This Exact Phrase,” then, when the results populate, hit “All” (instead of “Top”). This will show you all the influencers who have shared the post. You can head over to their Twitter profiles, on which they will usually have their website and name. By now you’ve managed to build a list of hundreds of authors, commenters and sharers in your target space by leveraging content entirely written by other people. But that’s only half the battle – the other half is getting them to care about what you’re doing. 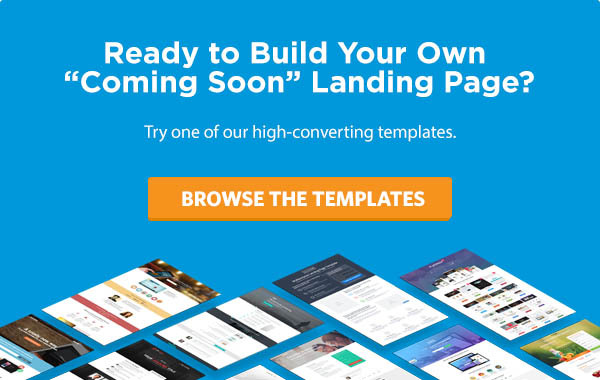 If you’re not sure how to get started or what your page should look like, check out one of Unbounce’s many free “Coming Soon” templates. You’ll have an optimized landing page up and running in no time! I’ll be the first to admit that engaging with a list of hundreds of influencers is daunting to the point of impractical. But the fact is that engagement will increase your conversions. If they know who you are, they’re more likely to care about what you’re doing. If you’re feeling overwhelmed, consider picking the top 25 or so on your list who you’d really like to win over and focus your efforts on them. Overtime, you’ll get noticed – and I’m willing to bet they’ll be more responsive to you when you finally reach out to them directly. At the end of the day, it all comes down to the pitch. Now is as probably as good time as ever to talk about cold outreach versus spam. After all, there is a difference – cold outreach is NOT spam. Don’t misrepresent who you are in the email. Don’t use misleading subject lines. 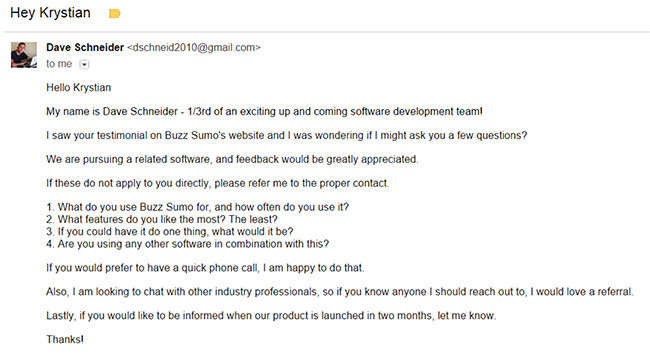 Identify if the email is an ad. Include your business address, such as a PO box. Give them an opt-out option. Personalize it. Do not send mass emails! Be honest about what you’re asking for. If the individual responded to this, I would reply with a link to our “coming soon” landing page so we could stay in touch during launch. If I had to do it over again I probably would have made it much simpler, and asked the person if they were okay with me asking them a few questions. Getting those small, incremental commitments in general ultimately leads to better response rates. With these straightforward tactics, we were able to recruit 400+ leads for our beta back when we were absolute nobodies in the space. We started with a list of around 1,000 influencers and their websites, and then turned to these 14 tips to find anyone’s email address. Over the course of one month we spoke with as many people as we could to get feedback about our idea. This built relationships with them, and down the line led to them being beta testers when we finally released the product. And with a little effort, a landing page and absolutely zero budget, you can do the same. David Schneider is the cofounder of NinjaOutreach, an innovative new Blogger Outreach software for marketers. 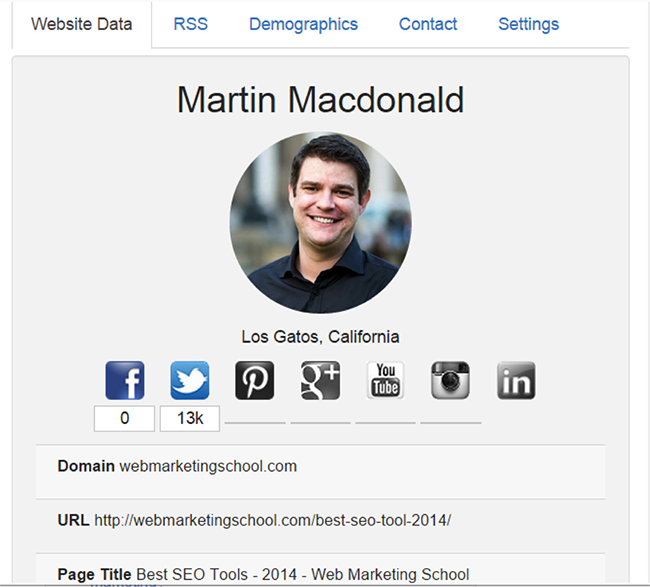 You can also find him on Google+ and at SelfMadeBusinessman.